For other uses, see Midnight sun (disambiguation). The Altafjord in Alta, Norway, bathed in the midnight sun. Around the summer solstice (approximately 21 June in the Northern Hemisphere and 23 December in the Southern Hemisphere), the Sun is visible for the full 24 hours, given fair weather. The number of days per year with potential midnight sun increases the closer towards either pole one goes. 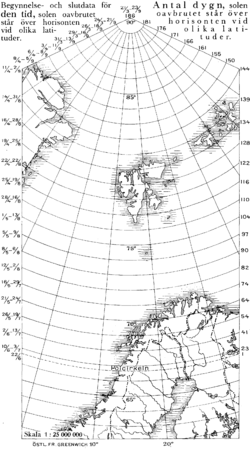 Although approximately defined by the polar circles, in practice the midnight sun can be seen as much as 55 miles (90 km) outside the polar circle, as described below, and the exact latitudes of the farthest reaches of midnight sun depend on topography and vary slightly year-to-year. Because there are no permanent human settlements south of the Antarctic Circle, apart from research stations, the countries and territories whose populations experience the midnight sun are limited to those crossed by the Arctic Circle: the Canadian Yukon, Nunavut, and Northwest Territories; the nations of Iceland, Finland, Norway, Sweden, Denmark (Greenland), Russia; and the State of Alaska in the United States. A quarter of Finland's territory lies north of the Arctic Circle, and at the country's northernmost point the sun does not set at all for 60 days during summer. In Svalbard, Norway, the northernmost inhabited region of Europe, there is no sunset from approximately 19 April to 23 August. The extreme sites are the poles, where the sun can be continuously visible for half the year. The North Pole has midnight sun for 6 months from late March to late September. The South Pole has midnight sun and experiences this from 23 September to 20 March (almost 6 months). The opposite phenomenon, polar night, occurs in winter, when the Sun stays below the horizon throughout the day. Since the axial tilt of the Earth is considerable (approximately 23 degrees 27 minutes), the Sun does not set at high latitudes in local summer. The Sun remains continuously visible for one day during the summer solstice at the polar circle, for several weeks only 100 km (62 mi) closer to the pole, and for six months at the pole. At extreme latitudes, the midnight sun is usually referred to as polar day. At the poles themselves, the Sun rises and sets only once each year on the equinox. During the six months that the Sun is above the horizon, it spends the days continuously moving in circles around the observer, gradually spiralling higher and reaching its highest circuit of the sky at the summer solstice. Because of atmospheric refraction, and also because the Sun is a disc rather than a point, the midnight sun may be experienced at latitudes slightly south of the Arctic Circle or north of the Antarctic Circle, though not exceeding one degree (depending on local conditions). For example, Iceland is known for its midnight sun, even though most of it (Grímsey is the exception) is slightly south of the Arctic Circle. For the same reasons, the period of sunlight at the poles is slightly longer than six months. Even the northern extremities of Scotland (and places at similar latitudes, such as St. Petersburg) experience twilight throughout the night in the northern sky at around the summer solstice. Observers at heights appreciably above sea level can experience extended periods of midnight sun as a result of the "dip" of the horizon viewed from altitude. The term "midnight sun" refers to the consecutive 24-hour periods of sunlight experienced north of the Arctic Circle and south of the Antarctic Circle. Other phenomena are sometimes referred to as "midnight sun", but they are caused by time zones and the observance of daylight saving time. For instance, in Fairbanks, Alaska, which is south of the Arctic Circle, the Sun sets at 12:47 am at the summer solstice. This is because Fairbanks is 51 minutes ahead of its idealized time zone (as most of the state is in one time zone) and Alaska observes daylight saving time. (Fairbanks is at about 147.72 degrees west, corresponding to UTC−9 hours 51 minutes, and is on UTC−9 in winter.) This means that solar culmination occurs at about 12:51 pm instead of at 12 noon. If a precise moment for the genuine "midnight sun" is required, the observer's longitude, the local civil time and the equation of time must be taken into account. The moment of the Sun's closest approach to the horizon coincides with its passing due north at the observer's position, which occurs only approximately at midnight in general. Each degree of longitude east of the Greenwich meridian makes the vital moment exactly 4 minutes earlier than midnight as shown on the clock, while each hour that the local civil time is ahead of coordinated universal time (UTC, also known as GMT) makes the moment an hour later. These two effects must be added. Furthermore, the equation of time (which depends on the date) must be added: a positive value on a given date means that the Sun is running slightly ahead of its average position, so the value must be subtracted. As an example, at the North Cape of Norway at midnight on June 21/22, the longitude of 25.9 degrees east makes the moment 103.2 minutes earlier by clock time; but the local time, 2 hours ahead of GMT in the summer, makes it 120 minutes later by clock time. The equation of time at that date is -2.0 minutes. Therefore, the sun's lowest elevation occurs 120 - 103.2 + 2.0 minutes after midnight: at 00.19 Central European Summer time. On other nearby dates the only thing different is the equation of time, so this remains a reasonable estimate for a considerable period. The Sun's altitude remains within half a degree of the minimum of about 5 degrees for about 45 minutes either side of this time. Locations where the Sun remains less than 6 (or 7) degrees below the horizon—above 60° 34’ (or 59° 34’) latitude south of the Arctic Circle or north of the Antarctic Circle—experience midnight twilight instead of midnight sun, so that daytime activities, such as reading, are still possible without artificial light on a clear night. White Nights have become a common symbol of Saint Petersburg, Russia, where they occur from about 11 June to 2 July, and the last 10 days of June are celebrated with cultural events known as the White Nights Festival. Map showing the dates of midnight sun at various latitudes (left) and the total number of nights. Even though at the Arctic Circle the center of the Sun is, per definition and without refraction by the atmosphere, only visible during one summer night, some part of the midnight sun is visible at the Arctic Circle from approximately 12 June until 1 July. 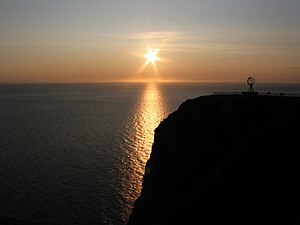 This period extends as one travels north: At Cape Nordkinn, Norway, the northernmost point of Continental Europe, the midnight sun lasts approximately from 14 May to 29 July. On the Svalbard archipelago farther north, it lasts from 20 April to 22 August. Midnight Sun Solar Race Team: With the midnight sun phenomenon, a solar-powered vehicle can continue driving 24 hours a day. ^ "What is the Midnight Sun Phenomenon? | Earth Phenomena | Planetary Science". Scribd. Retrieved 2017-08-25. Wikimedia Commons has media related to Midnight sun.